I am so excited to be sharing this box with you today. I am really pleased with the way it turned out. I have been seeing a lot of slider cards all over the internet recently. 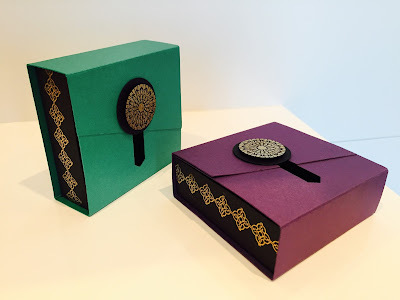 Stampin' Up have brought our some fabulous products to really simplify those WOW cards and I had an idea floating around in my head about using the slider idea as a clasp on a box - well, today's project is the culmination of those thoughts. 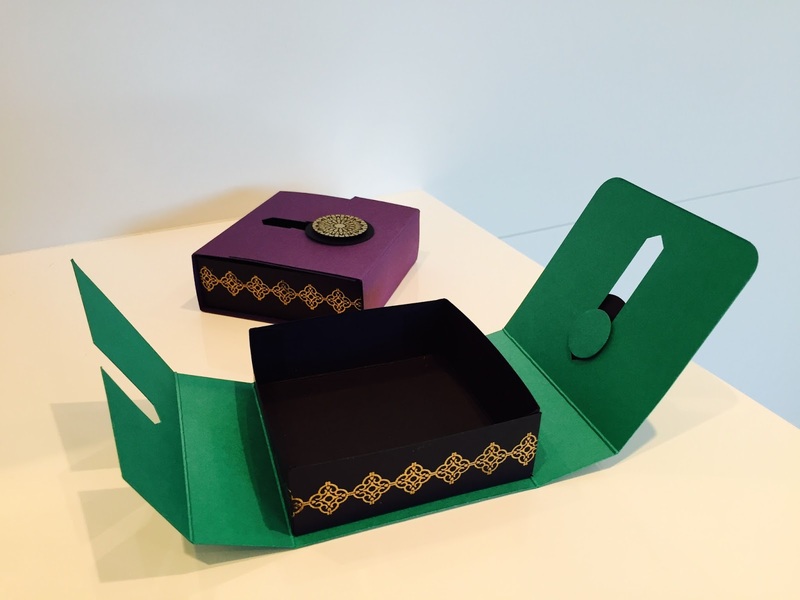 The box opens by sliding the circular clasp on the top to one side - it might sound complicated but it is really simple and really lifts a simple gift box to be something special. You can watch my video HERE to see just how it works and how easy it is to create. 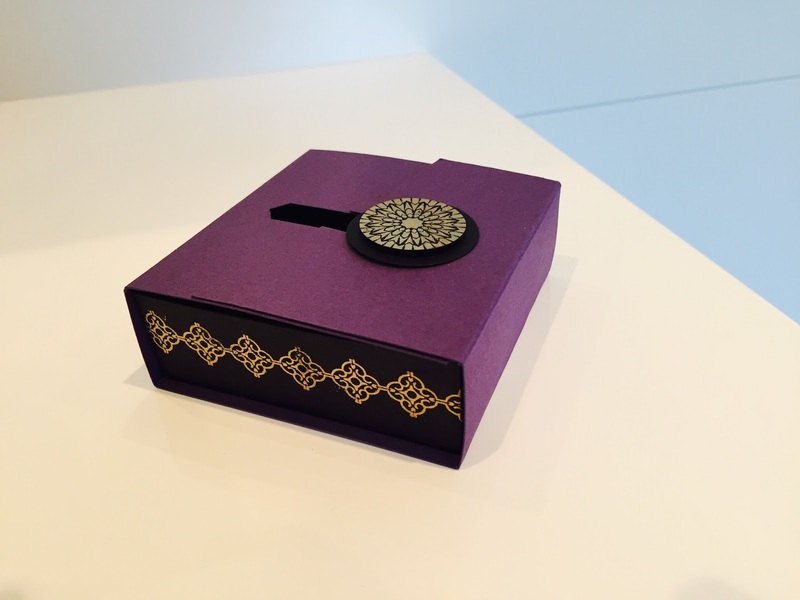 I've decorated the box using the Moroccan Nights Stamp Set. This set has been calling my name for a little while and I was doing well with resisting but finally temptation got the better of me. I love the intricate patterns and think they look amazing heat embossed in Gold here. I orignially made the box using Emerald Envy card stock, as you'll see in the video, I then made another using Elegant Eggplant. I am not sure which one I prefer - I think they are both very elegant and hopefully would make the most simple of gift really something special. HERE is the video tutorial if you'd like to make your own version. If you do give it a go, I'd love to see your intepretation. Thanks for the tutorial. They are both beautiful. Even though purple is my favorite color, I think the green looks very elegant. Thanks Lisa - I keep changing my mind as to which looks best. My mouth dropped open when I saw these boxes. So cleverly and beautifully designed. Will be trying these ones out. Thank you Caroline! Fabulous box. While watching I was trying to tell you to turn the black box upsidedown for support, but I see someone beat me to it in letting you know. Thanks for sharing. I love this box. I just had to try it out. I used the word window punch.